Adidas Extreme Power has taken you a new and unique flavor to this modern man. Adidas Extreme Power 100ml. Eau De Toilette - Unique fragrance for men Adidas Extreme Power symbolize the enthusiasm and joy of the game. Focusing on rival crowd roar and whistle sound - that's what football player feels that focuses on a single goal - that of winning. Picture perfume Extreme Power is football player Zinedine Zidane, who because of his personality and his skills on the field, has inspired millions of young people to want success. Top notes of the fragrance Adidas Extreme Power agreements consist of fresh lemon, bergamot galbanum captivating and charming. The notes consist of geranium plants sensual, apple delicious and tasty coffee. The impressive base notes are dominated by cedar, tonka bean, patchouli exotic tones and seductive sandalwood. This extremely masculine fragrance brand Adidas is designed for when sport. Experience the feeling of extreme power and great confidence in themselves! Let your instincts to speak and focus on the energy that exudes! 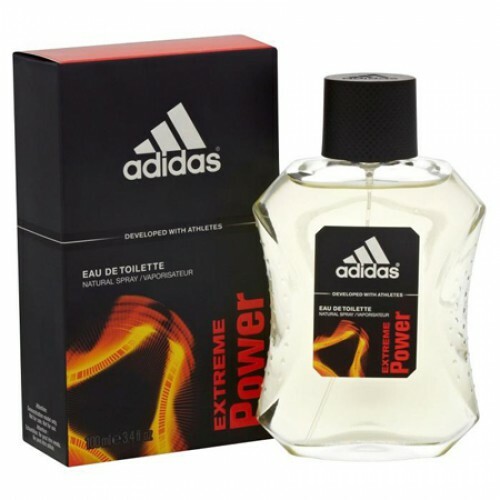 Exclusive fragrance for men Adidas Extreme Power, Champion awakens hidden inside you and give you strength for the game. The embodiment of pure energy, Adidas Deep Energy fills its possessor the power and self-confidence. The aroma is based on a bright, sparkling composition, where fresh notes of bergamot, mandarin and apple warmed masculine sensuality lavender, patchouli and cedar. Fragrance is designed for the modern, dynamic man, born to win and win.